"The challenge was to find a 4-star Chinese restaurant nearby, then find directions to it. Here's how it went down:"
Ben the PC Guy is at CES challenging users of other OS's to speed contests. 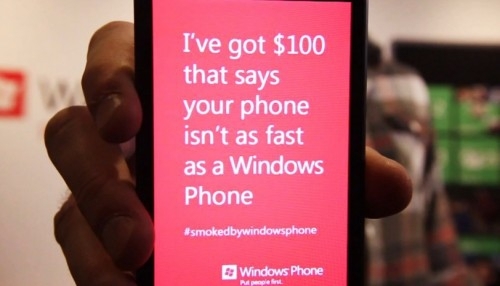 If Ben wins, the loser has to say "I got smoked by Windows Phone." If they win, they get to pocket $100.00. The first taker was using a Galaxy Nexus and the challenge was to find a 4-star Chinese restaurant with directions. This challenge highlights Local Scout and it's advantage over having to go through a search then pop over to maps for directions. You can watch the video here. The best part is when the Galaxy Nexus user asks, "What app are you using?" Of course to be fair the specifics of each "challenge" should be determined by an independent third party so that Ben didn't have the advantage of knowing in advance what he planned to do. Of course, this was not intended to be a fair challenge, but a somewhat rigged marketing tool, so I will give them kudos for being clever. This is interesting. The guy with the Galaxy Nexus doesn't really know the best or quickest way to do this challenge. If he had opened maps and then simply asked for "4 star Chinese Restaurant" the challenge would have been over before it started. He would have found the nearest one and had been a click away from directions OR even Navigation, something WM doesn't offer. So, does this mean Android is more complicated, and the average user wouldn't know this? Not sure, but it doesn't really prove that the average user on WP could do better either. Would the average WP user know how to use Scout like this? To me this is a very basic, non complicated thing to do in Android, when I'm looking for a local establishment, be it a restaurant, bar, car parts store, etc. I always start in Maps and go from there. If most users start in Google Search that can add an extra step or two, but in the stock browser (at least) it typically pops up with "places" that have a link to directions. Really surprising to me how this was confusing the Nexus owner. However, I suspect there may a lot of Android users that don't know how to best utilize the phone as it's strictly learn as you go. I know WP is trying to show us that there isn't that learning curve, just not sure if that is true, but have not really extensively used a WP at this point either. That's a good point, actually. Android does have a bit of a learning curve, and sometimes things aren't as well integrated as they should be.